B&B proprietor Laura Wright treats guests to special delights. 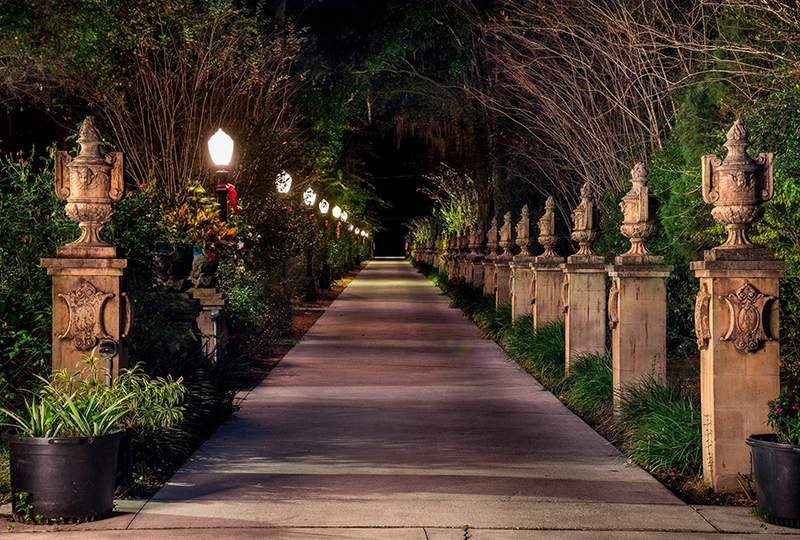 Tall concrete columns topped with urns adorn both sides of the gated, secluded driveway of Moss Gate Bed and Breakfast. The picturesque old-world ambience and canopy of old oaks make guests feel like they’re about to enter a magical place in a faraway land. Laura takes pride in making guests feel welcome, whether it’s opening Moss Gate to 300 people for a garden wedding on the front lawn, providing a luncheon for 15, or serving overnight B&B guests. “Many people call me the memory maker,” she says. She cherishes preparing memorable breakfasts with the freshest, locally sourced foods, including farm-fresh eggs she gets from the Coop of Hope, which is just a pontoon boat ride across the lake from Moss Gate; fresh-squeezed orange juice from Sunsational Citrus; peaches from P’s U-Pick Peaches; and honey from D&J Apiary. Luncheon guests (including some Style staffers) have been treated to the tasty chicken salad that Laura makes fresh on a near-daily basis and serves on real china, along with a delicious quiche made from the farm-fresh eggs, and scrumptious miniature red velvet and carrot cakes she whips up for dessert. 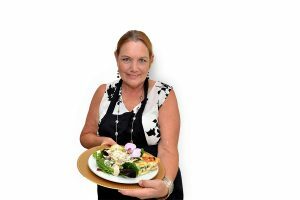 “I have tried to take the chicken salad off the menu for luncheons and people always ask, ‘Where’s the chicken salad?’ I totally learned if it’s not broken, don’t fix it,” Laura says. The chicken salad, along with beef brisket and several other entrées and desserts, have become Moss Gate staples. 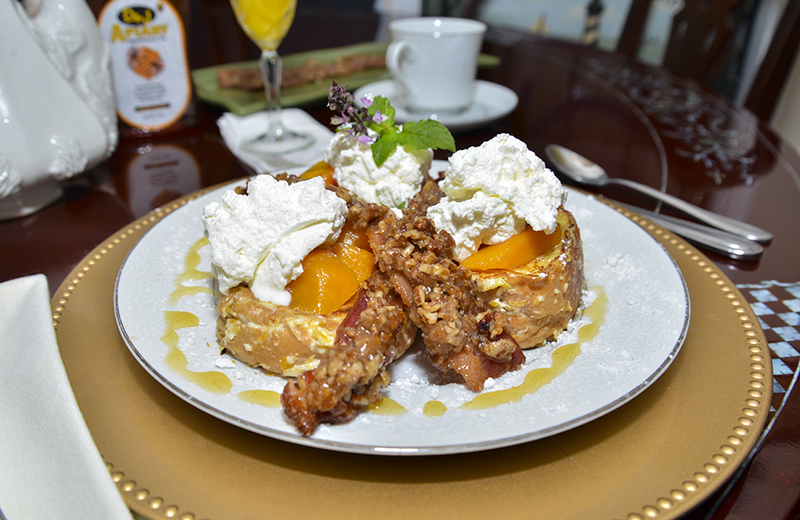 Laura’s husband, Tracy, loves her stuffed French toast and secretly recommends to B&B guests that they request it for their morning meal. “It really is yummy,” Laura says. She serves it with praline bacon and agreed to share both recipes with Style readers. The Wrights opened their turn-of-the-20th-century B&B in 2005. “We bought this so that I could be a stay-at-home mom and spend time with our daughter,” Laura says in raising Karlee Rae, who is now 19 and in college. An older daughter, Amanda, 39, lives and works in Indiana. Moss Gate has become popular with European visitors. Some are regulars who make annual trips to the United States and stay at the B&B. Cut bread into 16 slices about 1 inch thick. Cut a pocket in each slice almost to the bottom of the crust. In a bowl, stir together softened cream cheese and peach preserves. Beat eggs, milk, cinnamon, nutmeg, and vanilla till all combined. Spoon 1 tablespoon of cream cheese mixture into each bread pocket. Dip bread slices in egg mixture. Heat skillet with 2 tablespoons of butter over medium heat. Cook about 1½ minutes on each side or until golden brown. Drizzle honey and maple syrup over French toast. Drizzle honey over top of bacon. Place parchment paper on jelly pan followed by strips of bacon. Finely chop pecans in food processor. Mix pecans and brown sugar together and press into bacon. Cook bacon for approximately 20 minutes or until bacon strips start to crisp (not well done).